Silver war nickels issued from 1942 to 1945 are a bit of an oddity in the coin community. I say beauty is in the eye of the beholder. Often war nickels are grimey looking, almost like they have been found in an automotive garage. Regardless of the way they look there is a market out there for them. The silver melt value of war nickels is only $0.84 as they are only 35% silver, making them very affordable. 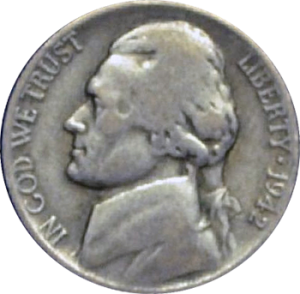 Although most Jefferson nickels, first minted in 1938, are nickel, those minted from 1942 through 1945 actually are a copper/silver/manganese composite. This was due to the fact that nickel is a key component of armor plating which was in high demand during the peak of World War II. Not only were “war nickels” important because of their silver content, but they were important as a symbol of the sacrifices necessary during war-time. During World War II, many things were rationed and ration books allowing purchase of commodities such as gasoline, wheat and sugar on certain days were commonplace. 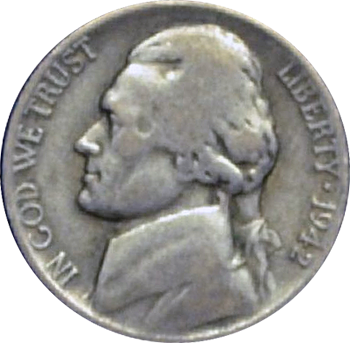 As a way to dedicate nickel resources towards wartime efforts, Congress authorized the U.S. Mint to manufacture nickels using a 50% silver/50% copper mix but gave the Mint the final say as to production composition. Ultimately, to ensure these nickels would work properly in vending machines, the final composition of 56% Copper/35% Silver/9% Manganese weighing a total of 5 grams with the standard 21.2 millimeter diameter was settled on for production nickels. Although there were around 900 million “war nickels” minted between 1942 and 1945, due to the short timeframe for production (ceased at the end of World War II) and the susceptibility of the composition for corrosion, war nickels today are very difficult to find in collectable condition. While any war nickel in virtually any condition is worth at least a dollar in today’s money because of the silver content, few of them command an unusually high value. The exceptions to this are the 1943 D in Uncirculated condition and what could be perhaps one of the rarest coins on the market to date, the 1943/2 overstrike. Due to circulation losses, lack of verification until 1978 of the overstrike and due to the “silver rush” in January, 1980, as much as 85% of the entire 1943/2 run may have been destroyed. This means as few as 40,000 1943/2 overstrike Jefferson war nickels may still exist in any condition.